Crackheads2 is gourmet 60% cocoa dark chocolate covered espresso bean with a crunchy candy shell with a big caffeine boost added! Gourmet meets functional. Each box of Crackheads2 contains the same caffeine in approximately 6 cups of coffee, 7.5 Red Bull energy drinks, or 11 cans of Mountain Dew. Crackheads 2 Candy is not suitable for children and should be kept from their reach. 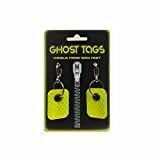 Ghost Tags Small Metal Clip Pet Safety Reflector Visible from 1200 Feet! One evening last week, I sat down with my family to what was promising to be a wonderful dinner. Shortly after we got started, our dog came waltzing by with a little more pep in her step than usual. She lied down and continued to chew on a dinner of her own, one that we did not give to her. To the non-dog owners reading this, let me tell you that this never turns out good! Upon closer inspection of her foraged snack, my mind and heart synchronized themselves in a breakneck race for an all time speed record. A box of something had been ravaged by this lovable 70lb Boxer of ours and I immediately knew what it was. Bailey had consumed an entire box of Jitterbeans, which are coffee beans that are not only covered in chocolate, but amped up to a total caffeine content of 600mg. Needless to say, our pleasant dinner came to an abrupt halt. An emergency vet hotline put us on the right track to deal with this issue, and after 5 worried hours, Bailey looked like she would make it just fine, which she did. Thankfully, for the sake of this review, I had another box of Crackheads Squared, which are the same thing as Jitterbeans but with a different name. Bailey did not eat the box of regular Crackheads, either, so the show will go on! For a second, though, I couldn't help but laugh at the possibility of contacting the sender of the product to say, "my dog ate my homework!" I guess I must have enjoyed outsourcing some of my review to my dog, because I brought my dad on board to help with this subject. Crackheads are essentially chocolate covered coffee beans and I cannot stand the taste of coffee. My dad, on the other hand, is involved in a life-long relationship with coffee. In an effort to give you a faithful review, I let my dad eat some of the beans and surveyed his thoughts afterwards. Straight from the mouth of a coffee lover who I fully trust, Crackheads are a top-rate snack. When sucked on and not chewed, the chocolate coating yields an invariably pleasing experience the slowly morphs into a coffee fix. A box of Crackheads, which smugly states "we're all addicted to something," contains a total of 200mg caffeine. Now this in itself is impressive for a caffeinated candy. In the shadow of its sibling who got all the attention, though, it's nothing. A box of Crackheads Squared which more sincerely states, "USE CAUTION!" 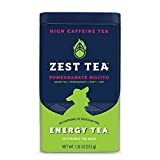 contains an almost frightening total caffeine content of 600mg. When I first held a box of Crackheads Squared and noticed the energy content, I half expected the beans inside to start jumping around like their Mexican cousins. For all of you, I plugged my nose and ate as many of these little morsels as I could (reminder: coffee is so not my deal). I couldn't use such a vindicated phrase as "in the name of science", but I was able to happily say, "this one's for you, Caffeine Informer readers!" as I gagged my way through the boxes. It doesn't take much more than ten Crackhead Squared beans before a power surge starts to build. Keep going and the obvious ensues. 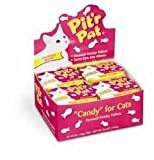 Contrary to Bailey's enthusiasm, I would not recommend slamming a whole box of these candies. As for the regular Crackheads, they're a great snack that any coffee lover should enjoy from start to finish in one munching session. The energy will not be staggering, but it will be there. Every single second of my experience with this product has been astonishingly abnormal, sometimes to the point where I was ready to burst out into maniacal laughter. In all honesty, I'm mentally exhausted from trying to make this review sound normal. So I'll leave it to you to make your own conclusion from the preceding mess of information. I'm going to go take a nap.